Earlier today, Wikileaks tweeted out a series of three terse, confusing messages, each containing a 64-character code. Now a lot of people think Julian Assange is dead. 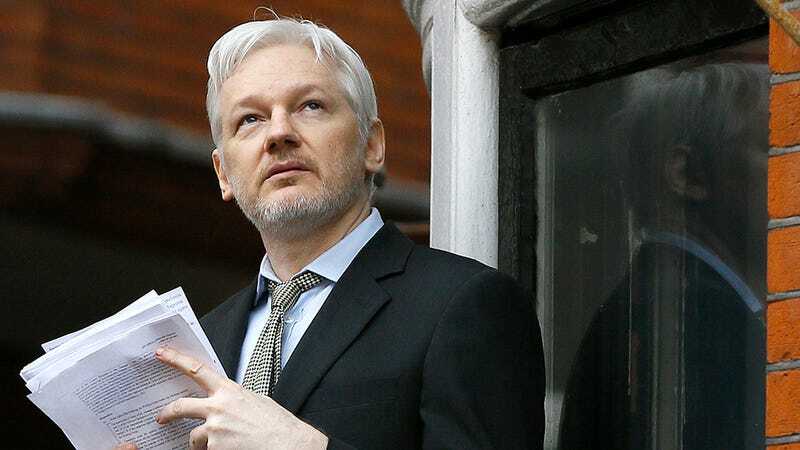 In the absence of context, some users on Twitter, Reddit, and various image boards were quick to speculate that the tweets were the result of a “dead man’s switch,” triggered in the event of Julian Assange’s untimely end. Such switches do exist (both mechanically and electronically) and many speculated that all 349 gigs of the heavily-encrypted “Wikileaks insurance” from 2013 are intended for precisely that purpose. Much as these tweets provide great fodder for conspiracy speculation, the secret to their meaning is hidden in plain sight. “Pre-commitment” in this case is a references to a cryptographic scheme to prevent unreleased information from being tampered with. Essentially those unique codes are proof to anyone reading the documents in the future that their contents remain unchanged: alteration to the leaks will likewise alter those 64-character codes. The same strategy was used by Tor Project developer Andrea Shepard in a warning shot that may have helped reveal years of Jacob Applebaum’s sexual misconduct. Likewise, Edward Snowden tweeted (and quickly deleted) a similar code in August, though its meaning remains uncertain. A torrent file and accompanying SHA-512 hash was even used by someone on Reddit’s r/SilkRoad to share sensitive forum information. The tweets from Wikileaks appear to be in line with these prior examples—and surely a true “dead man’s switch” unleashing all the data Assange currently possesses would amount to much more than three measly leaks. Further undermining claims of Assange’s death, the Wikileaks account retweeted something approximately 2 hours ago. In any case, we’ve reached out to them to confirm that Assange is still alive. What remains to be seen is when Wikileaks plans to make these three leaks public, and what they’ll contain. Update 10/17/16 8:53 EDT: A volunteer with Wikileaks confirmed that Assange is very much alive, even tweeting out some photos of them together.